This week’s New England Journal of Medicine reports that in a large and systematic study of thousands of premature births, a tiny minority of babies born at 22 weeks who were medically treated survived with few health problems. The study also found that hospitals varied widely in their approach to 22-week-olds, ranging from a few that offer no active medical treatment to a handful that assertively treat most cases. 22-week-old babies did not survive without medical intervention. In 78 cases where active treatment was given, 18 survived, and by the time they were young toddlers, seven of those did not have moderate or severe impairments. Six had serious problems such as blindness, deafness or severe cerebral palsy. 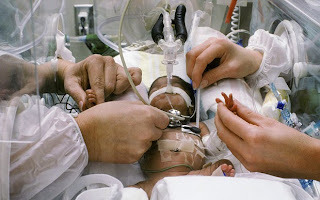 Of the 755 born at 23 weeks, treatment was given to 542. About a third of those survived, and about half of the survivors had no significant problems.